Today was a legal day. We woke, dressed, ate a quick breakfast and then joined the others and our ISM guides and boarded several servisse to the Israeli Supreme Court. The building is quite impressive; the security is annoying, but, unfortunately, its ever-presence begins to feel inevitable. It made me feel relieved that I will be leaving here, that I will be free of it; I resented the feeling and was ashamed of the feeling. I realized, as I stood in line waiting to be checked by army people, that though I could understand what the Palestinians feel, I would never really know what they feel. Standing outside of the court as we entered there was a fully armed, beret-wearing young man dressed in civilian clothing. I wondered who he was, but there was no one to ask. We finally all got through the security check and were allowed upstairs to wait in the large waiting area outside the courtroom for the court’s decision to be handed down regarding a petition by the people of Biddu and its neighboring villages to have the Wall declared illegal. The Israeli Supreme Court had agreed to hear this case, one of many Palestinian petitions, on this particular day because in a few days, the International World Court would rule on the legality of the Wall and Israel wanted to show the world that she could handle her own problems. While waiting for the outcome, we stood and chatted in the lobby. Suddenly, two women came near me and said loud enough for me to hear, “Is that her? Yes, I think it is.” They started walking toward me as I began to look behind me, thinking that someone famous must be there and that was where they were headed. They came upon me and asked,” May we take a picture with you?” Confused, I said, “Sure.” They got very excited. “Oh, you don’t know how much you have affected us or what an impact you have had on us.” Suddenly, I realized they were referring to the fact that my family was vilified because Adam, our son, in the early days of the intifada, spoke out on world television about the criminality and inhumane actions of the Israeli government and military in its perpetuation of the occupation of Palestine. When they continued, “We are Sister Helen and Mary of the ….Church in Detroit, Michigan, and we have met Adam and Huwaida so many times, but it is you and your husband we have been longing to meet,” I stammered, “I’m just a mother. I did what any mother would do.” But they refused to accept my plaint and asked for three more photos with “their hero.” At once it was a strange, embarrassing, yet exhilarating experience. When WCAers ran over to ask me who these women were and what was going on and I told them how silly it was, the women all said, “Doreen, you have no idea the impact your family has had on people.” For the next few minutes I thought about what had just happened and I smiled, realizing that all the horror we had gone through – the hate mail and death threats, the cold shoulder from colleagues, the strange looks from neighbors, the police escorts, the FBI interviews, all because our brave son spoke out, and we, his family, supported him – all of this had a good end if it inspired people to speak out and take action in defense of the Palestinian people. After a while, the lawyers emerged from the courtroom. Reporters were all over the place, and by eavesdropping on an interview we were thrilled to learn that the court voted in favor of the Palestinians. The Wall would have to be moved back to the Green Line. It was ruled that Israel’s Wall was placing a hardship on the Palestinian people and was violating their rights. It was a great victory. 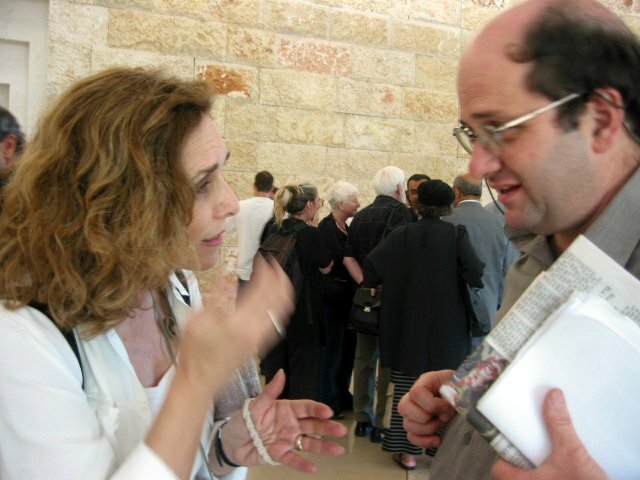 While Adam Keller, an Israeli peace activist from Gush Shalom, spoke to me about the decision, it was then that I understood that the Israeli court gave such a ruling to show the world that they are understanding of the Palestinians and sympathetic and that they can take care of this themselves. He predicted that when the World Court ruled later in the week that the Wall is illegal, the Israeli government would say, we know, we are taking care of it and then go on continuing to build. And I am sure that will prove true. Adam Keller explains what, exactly, the decision of the Supreme Court means. We stubbornly decided to remain cheerful and feel as if the court’s ruling was a true victory for Biddu. 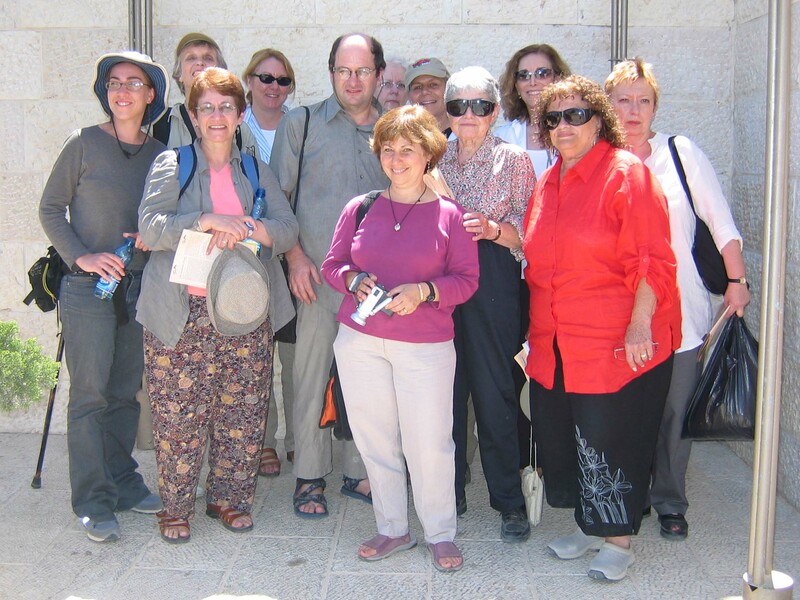 After taking a group photo with Adam Keller, we all got into several taxis and made our way back to the hotel that we had stayed in, in East Jerusalem. From there we were on to the courtroom where Mohammed, the Biddu ISM coordinator severely beaten and arrested at the A-Ram demonstration, was to have his hearing. When we arrived, Stacey decided to get to an internet café to post photos, while the rest of us waited and waited for Mohammed’s case to be decided. WCA poses with Adam Keller in front of the Israeli Supreme Court house. Outside the courtroom were other ISMers, people from Gush Shalom and Ta’ayush. Gabe, from ISM, approached Gail and me and told us that money was needed in order for Ann to get her hearing and that waiting for Ann’s parents to wire the money would take too long. Gail said that she would exchange some of her traveler’s checks to lay out the money. We told Annie and Jenny that we were going to find a bank or money exchange place to take care of this and went on our way. After attempting to make the exchange at every bank in the area, we finally found an exchange place that would change Gail’s traveler’s checks, but it was quite costly, shockingly costly. We hustled back with the money for Gabe, anxious for Ann’s hearing to finally be scheduled. Shortly after we returned, Huwaida came out of the courtroom to tell us the news. The judge was prepared to release Mohammed, but the Israeli government appealed, so the judgment was postponed until Friday, two more days in jail for Mohammed. Disappointed, we headed back to the internet café in the Old City to meet up with Stacey. She and Judy, however, were over at the Notre Dame Hotel, sitting and relaxing, drinking and snacking. So we all sent off our emails and walked across the street to join them and once there, we decided to stay for dinner on the beautiful terrace. We even discussed possibly treating ourselves and checking in there one night before we returned home to the states. However, we thought better about it. After dinner we caught two vans back to Biddu to our very comfy community center suite. It was a long day, filled with some of the expected tensions of traveling with 14 women. But to our credit, we handled ourselves, and some testy situations, rather well.